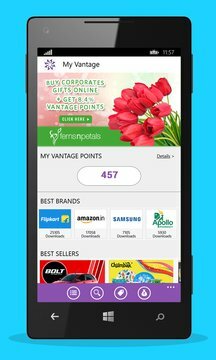 Vantage Circle is India's leading employee advantage platform, and brings special offers and exclusives across various segments like restaurants, automobiles, travel, electronics, apparel, home products, kids etc. and all of it customized for YOU. Now get the best privileges handpicked from over 1558 national and international brands, any where, any time on your mobile device with the official Vantage Circle Windows Phone app. - An intuitive, user friendly interface that will enable signed-in users browse through multiple product categories and also do a quick keyword search. - Users can simply click on the “Get It” button and avail the coupon code and other details needed to avail the deal. No debit or credit card required! 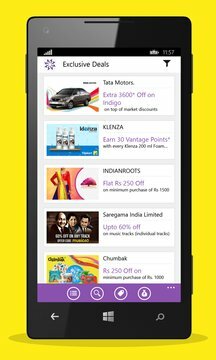 - An Online Deals section featuring India’s most loved brands such as Flipkart, Amazon etc. which are now just a button click away. - A Card Deals section featuring deals not just for corporates but open to all, with information on the distance from the user and the location map.